Turning into a were-car is a terrible curse that can befall robots. Most modern day people consider were-cars part of ancient folklore and scoff as it as silly ideas. Some unfortunate robots have, however, realized that this myth has a factual core. When a robot is infected with the curse, it won't be aware about it. Every midnight, when the internal chronometer resets, the were-car routine is activated. Powerful algorithms cause the original program to be overridden and the were-car routine takes complete control of the body. Advanced morphology programs, integrated in the were-car routine, cause the body to change into a transportation vehicle. The result looks almost like a normal hover car, but the ancient origin of the were-car curse shines through. Rather than superconducting electromagnets, the propulsion is done through a chemical combustion inside the car, the resulting force is then transferred to a collection of vulcanized rubber discs. Through friction with the ground forward motion is achieved. Ancient texts name these rubber discs "wheels." Were-cars prowl the surrounding area at night, looking for innocent victims. When a robot is attacked by a were-car the virus is transferred through the were-car's headlights. Humans are usually killed. The next morning, the were-car program will have ran its course, and the robot will have no memory of the events. When a robot is hit by the were-car virus, it's only options is to find the origin of the virus and kill it, or commit suicide, otherwise the killings will never stop. When the originator of the were-car virius is killed, it will transmit the uninstall command. With Project Satan dead, it is believed that anyone who received his infection is cured, however there may have been others like Project Satan. Were-cars are based on werewolves. 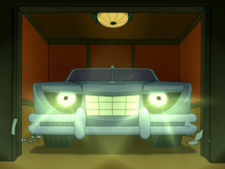 Furthermore, Leela's suggestion that they jam the tailpipe with a silver potato is a reference to two ideas: the idea that killing a werewolf requires shooting it in the heart with a silver bullet, and the urban legend that jamming a potato in a car's tailpipe will cause its engine to explode, or perhaps both. The idea of a killing car might come from Stephen King's book (which became a John Carpenter's movie) Christine. A demonic killing car also featured in the 1977 movie "The Car". This page was last edited on 5 September 2013, at 14:28.